Castello di Brolio – home to the oldest winery in Italy. This impressive medieval castle offers outstanding views across the Tuscan countryside towards Siena. 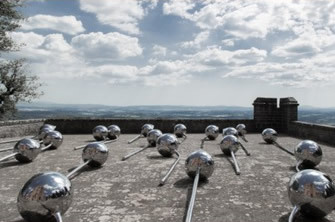 Internationally renowned Swiss sculptor Not Vital, who participated at the 2001 Venice Biennale, is showcasing a selection of 25 steel Lotus Flowers, from an installation of 100 Lotus Flowers, on the castle terrace.